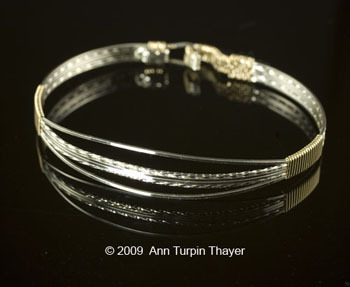 Ann Turpin Thayer created The Fine Art of Wire Wrapped Jewelry – The Thayer Method and has taught it since 2004. Ann has now designed a jewelry workshop program especially for DMC and area resorts for their convention guests. No jewelry making experience required. You can offer guest entertainment that will be talked about long after the trip is over! Your group will love what they create in a hands-on jewelry class with award-winning jeweler Ann Turpin Thayer. 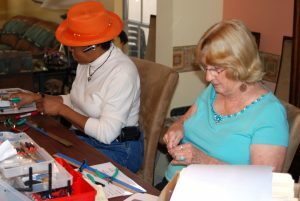 In her 3-hour workshop, Ann shares insider jewelry information while participants learn to set their own genuine gemstone post earrings and then move on to make Earring Jackets or Earrings for non-pierced ears. It is sure to “Razzle Dazzle” them. Ann provides all materials for the projects and tools to use, and a step-by-step illustrated guide for guests to take home so they can make more. Ann can accommodate up to 35 participants. Both Earring Posts and Earring Jackets are completed during the “Make and Take” session. NO EXPERIENCE is necessary. Workshops are conducted “on Property” with a simple set-up indoors with beverage and snack. Women love jewelry, men love giving jewelry, and companies search for “new and different” venues to entertain clients at conventions and conferences. Ann’s teaching experience ensures all participants will love going home with jewelry they made themselves. For more detailed information including pricing, and/or to schedule a workshop, please contact Ann by calling her at (602) 680-7444, contact her by email at Ann@AnnTurpinThayer.com, or use Ann’s Contact Form. Fees: Only $95 per person; 50% nonrefundable deposit required. Are you ready to have a new experience to offer your guests? I am pleased to announce that after eight years of teaching my popular jewelry-making courses, I have created a Contemporary Dangle Earring that will tickle your guests, a workshop especially designed for spouse programs/vacation travelers. Men love making these earrings as much as women do, maybe more! In my fun-filled three hour session, I share “insider secrets” while participants discover how to set their own genuine gemstone earrings and then learn how to make elegant Argentium™ Sterling Silver earring jackets to dress up their new creations. Every guest will take home their very own earring set—perfect for keeping or giving—worth $190 in retail value. Ann has participated in over 100 juried shows and exhibitions over the last 10 years and has done as many as 27 art shows in one year, including eleven years at the International Juried Art Show, Celebration of Fine Art in Scottsdale Arizona. Ann is a superb teaching artist, she loves what she does, she does what she loves, and she does it to perfection. You will not find a more tireless champion for your growth and development. The value of the materials you receive is only exceeded by the quality of the instruction you will receive. ~Marilyn E.
I took Ann Turpin Thayer’s wire wrapping class and was very pleased and surprised not only at what I learned but all that Ann gave us. She is truly a master at her craft. She was a patient teacher who gave so much of her experience, herself, her talent and her time. Don’t miss your chance to learn from a master. 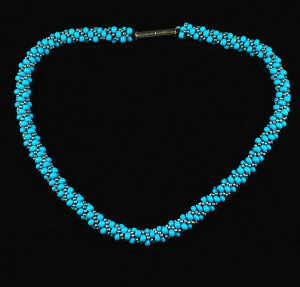 ~Jean G.
Ann Turpin Thayer welcomes DMC and Corporate commissions for incentive gifts. Whether it is bracelets, earrings/jackets, pins or pendants, Ann will work with you to create VIP (Very Impressive Pieces), for your event or occasion. For more detailed information including pricing, and/or begin working to create special piece, please contact Ann by calling her at (602) 680-7444, contact her by email at Ann@AnnTurpinThayer.com, or use Ann’s Contact Form.